Hussien Dekmak is a name you might not be familiar with. That is to say, if you live outside London or you have not thus far had much interest in Lebanese food. Hussien is a young chef who has brought Lebanese food to North London in the guise of his celebrated restaurant Le Mignon. Time Out has called it “an outpost of classic Lebanese cooking in Camden”. The Lebanese Cookbook draws you in from the first glance. The cover is subtle but impressive with contrasts of matt and gloss, and the classy photography continues inside. Martin Brigdale has presented some of his best work here. Crisp pictures that show off Hussein’s dishes to best advantage. The marvel of these recipes is that they are so simple. Many pages have two short recipes and that helps to calm the nerves of the less confident cook. All the ingredients will be available in your favourite supermarket with perhaps a trip to the spice emporium for spices such as sumak and Lebanese spice mix (you can make that yourself from common spices that you probably already have), but you’ll find a packet of that lasts ages. The joy of Lebanese food is that there are plenty of vegetarian choices. A traditional Lebanese meal finds all the dishes served at the same time, thus getting over the embarassment of presenting different dishes for guests some of whom are vegetarian, others who prefer seafood to meat, and others who really only want to eat bread and salad. There are lots of the familiar favourite Lebanese dishes here but also a few that are less often served in your local restaurant. Broad Beans with Garlic and Coriander has just four ingredients plus seasoning. Fried Mushrooms with Garlic is quick and simple and both these dishes would make lovely additions to the traditional Mezze table, or just use them as side dishes. Hussien has plenty of lamb recipes as expected but also chicken and fish. Fried Jumbo Prawns with Garlic would be my pick for a fast but decadent meal. Not cheap these days but what a treat. Grilled Fish on the Barbecue would be delicious and has a hint of cumin. Serve that with some salad and Lebanese bread – and Hussien thoughtfully gives you the recipe for that as well. 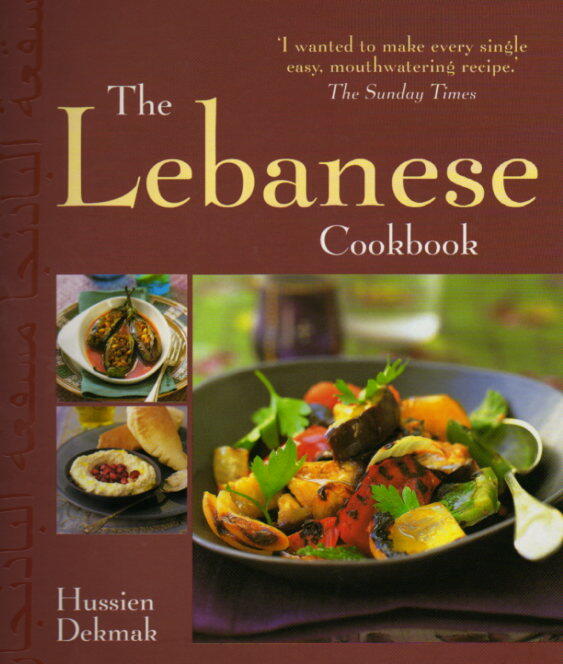 The Lebanese Cookbook is an attractive introduction to Lebanese food. Delicious!